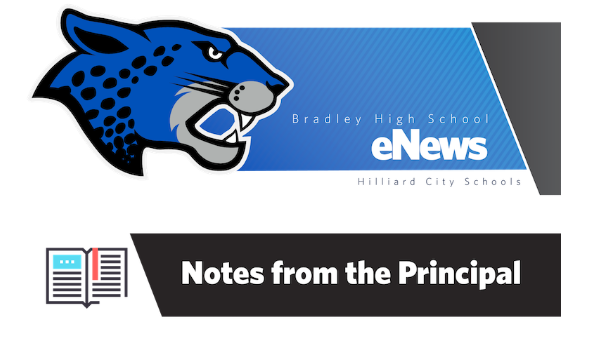 Bradley High School has started to notify parents/guardians of their child’s unexcused absence from school via an automated message at 9:40 a.m. This addtional communication procedure is to ensure the safety of our students during their commute to school as well as complying with recently signed legislation – House Bill 66. If you receive this message at 9:40 a.m. it is because your child has been marked absent for one or more periods (during the first 120 minutes of the school day) without parental notification. Upon receiving this message, please notify the attendance office with the reason for the absence as soon as possible so our records can accurately record the instructional minutes of school missed. If you believe you have received this message in error, please contact our office. State AIR Testing will continue this week. See the dates below. We will operate on a 2-hour late start on the days of testing. Students who attend the ILC should communicate with their teacher on any revised schedules for these days. Academic Awards (9-11- invitation only) April 16 @ 7 p.m.
Senior Scholarship Ceremony April 17 @ 7 p.m.
Tickets are $75 and include dinner and parking. All seating is reserved. Large groups are encouraged to purchase their tickets early for the best available seating. Tickets must be purchased by April 17 at midnight – NO EXCEPTIONS! THIS DOCUMENT will help seniors understand information about graduation and any other important information before that big day in May! Trying to find the perfect way to express your love, pride, or just sheer congratulations to a special senior upon his/her graduation? Or maybe you’re a senior who wants to say good-bye to someone? The Bradley Yearbook Staff has just the thing! PLACE A WISH AD IN THE YEARBOOK! Get all the information you need on the yearbook website at http://is.gd/hbyearbook or onthis document. Deadline for wish ads is Friday, May 3. Are you too busy to participate in PTO events but you still want to help? You can always donate to our PTO. This money goes to helping pay for teacher meals and coffee carts. The money also assists our students who are in need. We hope you can help this important organization. CLICK HERE for more information. The Hilliard City School District is hosting their 5th annual Summer Enrichment Camp for current kindergarten through 6th grade students during the week of June 10- 14, 2019. There are a variety of classes being offered by Hilliard staff in the areas of science, art, technology, exercise, engineering, and more! Students can choose to attend a morning class, an afternoon class, or both. Click here to find out more information and register for Summer Enrichment Camp. Registration is open Monday and closes Monday, May 6th. Class sizes are limited, so sign up as soon as possible! If you have questions, please don’t hesitate to email the coordinator at paige_canale@hboe.org. Please join us for a fun, family friendly spring race hosted by the Hilliard Davidson Band Program in partnership with Orphan World Relief, a non-profit organization here in Columbus working tireless on behalf of orphan and foster children both here and abroad. There will be a kids area where we will have face painting, inflatables, and characters dressed up like Superheroes and Princesses. There will also be an award ceremony following the race where some great prizes will be awarded to the winners of each age bracket. Plus, the Hilliard Davidson band will be performing along the race route to energize the runners. It will be a WONDERFUL way to spend a spring afternoon!